Views galore from this superbly positioned modern villa with pool. Perched on the crest of a hill, Casa Nuvola is a firm favourite with those looking for chic but practical accommodation, mesmerizing sea views and an al fresco dining and living area that has few rivals. If you do manage to drag yourselves away from the pool and the views, the charming town of Cefalù and a series of long sandy beaches are just a few kilometres away. Inside: Casa Nuvola is all on one floor, simply but practically organised. One large, luminous open-plan room with a sloping beamed ceiling and skylights comprises a comfortably furnished living area, a modern kitchen with central island and a dining area. A series of French windows illuminate the interior and lead out on to the surrounding terraces and pool. Off this central day area are the five spacious bedrooms (3 doubles and 2 double-twins), all with en-suite bathrooms (4 with shower and 1 with tub). Each bedroom has French windows leading out onto the surrounding terraces. White is the predominant colour of the interior, with soft beiges, greys and browns all adding to give a cool, contemporary chic feel. Outside: the house is surrounded on all sides by terraces. To the front is a panoramic shaded terrace complete with outside living area and dining table overlooking the sea. Directly next to this is the lovely pool, complete with a variety of cushioned sunloungers and outdoor recliners. Views from the pool take in the coast below and the hills behind. Please note that the pool is about 3 metres from the indoor living room and right next to the outdoor dining area so young children who are unable to swim should be carefully supervised. Set in the coastal foothills of the Madonie Mountains and just 1km from the sea as the crow flies, Casa Nuvola is in a perfect location for those who wish to mix mountains and sea. Down on the coast below are miles and miles of sandy beaches, while a short drive inland will take you deep into glorious walking country and spectacular scenery of the nature reserve and its delightful Mediaeval towns and villages. Just fifteen minutes' drive away is Cefalu', with its spectacularly sited Norman cathedral, mediaeval town centre and sandy beach. Cefalù also offers a good and varied selection of restaurants and bars. The motorway gives you easy access to Palermo, Monreale and the Roman remains at Solunto. Slightly further afield, the Ancient Greek remains at Segesta (west past Palermo) and Tindari (east along the coast) are well worth day trips. "We thought Casa Nuvola was fantastic." Casa Nuvola is a fabulous house in a great location and the in-house cooks are terrific. We loved Casa Nuvola and the views. Casa Nuvola was as promised. Very efficient layout. A lovely property - light and airy. A good pool with stunning views down the coast. What we enjoyed most about our holiday? The ambience of Casa Nuvola. The website depicted realistic photographs of the villas so the correct level of expectation was set. We thought Casa Nuvola was fantastic. Casa Nuvola, the property and the views, exceeded our expectations. The entire experience was a pleasure. There is nothing we did not enjoy. Meeting the owners upon arrival was very nice and the two in-villa chefs prepared an outstanding Sicilian meal. We will definitely use The Thinking Traveller again and will recommend to all our friends. Casa Nuvola is a big spacious house - bigger and better than we had imagined. En-suite bathrooms in every bedroom was a real plus. Casa Nuvola exceeded expectations and then some. If we could bottle this villa and place in in other destinations we would - this place was that good! We had an absolutely superb holiday at Casa Nuvola. Lovely owner, and great service from you guys. Amazing views, what can I say? We were gutted we hadn't booked two weeks. The villa was wonderful and the cooks superb - it was a bit further from Cefalu than I anticipated but this was more than made up for by the view. Casa Nuvola gave us the opportunity to visit other villages (we had not previously seen). We were able make our own tour. Loved it! Our holiday was wonderful. Casa Nuvola was very well equipped and beautifully situated. We really enjoyed the villa - perfect for our group. Loved the food and fresh local ingredients. Overall we had a great time. We really enjoyed the meal cooked for us in-house and we're glad we had asked for the pool to be heated as the whole family loved the pool and the 3-year-old became very confident in water while we were there. We all enjoyed the warm weather, the comfortable house, the fantastic views and we all felt better and relaxed being there. Casa Nuvola is an amazing villa, well laid out and perfect for a large group. We had an amazing trip, made better by the quality of the villa and its location. The comfort all round and easiness of having all on one level really made it a divine stay. We were incredibly glad that we had booked the cooks each evening offering excellent price and variety of menus, meaning that we practically stayed in the villa all week. This option should be evidenced in your description for Casa Nuvola as a must for holiday makers needing to chill to the max! Thanks for this…along with the convenience of the Planeta wine order. We had a great time at Casa Nuvola and your company was the most thorough of any rental agency that I have dealt with. The villa was lovely - very comfortable. We enjoyed out holiday in Sicily immensely and hope to visit again soon. The location of the villa was truly beautiful. We just loved the villa. It was very clean, the kitchen was well stocked, the views were amazing, the sunset awesome; everything about it was perfect... Our trip to Sicily is still magical - can't get the feeling out of us. Thanks again for all the service you provided for us. Loved the villa, views are amazing. All of us really liked the private en-suite bedrooms, the large interior open space and everything that was included in the kitchen. We loved cooking, especially since the owner planted fresh herbs - how kind of him! The exterior was superior. The patio, outdoor living areas, pool, gardens and views is what attracted me to Casa Nuvola in the first place. The owner is a true Sicilian gentleman. He was simply delightful and very helpful at all times. The staff prepared authentic, rustic Sicilian dinners for my guests and me and we really enjoyed them and the food. They represent Think Sicily very well. Thank you for making this a spectacular holiday. The service and administration is just exceptional. Casa Nuvola has the perfect layout for a group. It was cozy but spacious and had a well equipped kitchen... Our fondest memory will always be the views from Casa Nuvola. We experienced some spectacular scenery in Sicily but not one could compare to the view from our villa. The sunsets were fantastic! Great villa, stunning views and lovely place. The house was really beautiful and the owner was very nice and helpful... We had a terrific holiday! It was one of the best holidays that we have had. We loved our Holiday!!!! Casa Nuvola pictures on the website were an accurate portrait of the beautiful villa... The owner of Casa Nuvola was splendid and very attentive to our requests. We enjoyed the homemade oil and his wonderful hospitality... We enjoyed the in-villa cook staff. It was great to come home after a long day of sight-seeing and have a real Sicilian meal prepared for us. A very well appointed villa... The in-villa cooks were brilliant, the food and service was suberb. It was my daughter's birthday and they asked Barbara what her name was so they could have it put on a cake for her. Excellent!. My family and I could not have been happier with the villa. It was a perfect layout inside and the view and pool were absolutely stunning. It couldn't have been more perfect. Our trip would never have been possible if it were not for everyone at Think Sicily, but I would especially like to say that Barbara D'Agostino (our Local Manager for West Sicily) is a God send. I know in my heart that she really wanted us to come to Sicily and did more than everything in her power to make sure it happened. She is amazing and should be commended for the level of care she took with my family. Wine delivery was wonderful... it was so great to have it waiting there. the 4x4 Etna trip was great! Roberto was a wonderful guide and he was amazing with my niece (3 years old) and nephew (5 years old) as well as all of the adults on the trip. The in-villa cooks were stellar! The best meals we had in Sicily (and they were all delicious) were from them! They were professional, courteous and overall just wonderful. Our holiday? Wonderful, we have already recommended you to many of our friends! When we next plan to be in Europe we will certainly use you. The house was comfortable and well set up. Great views and clean. We were regretful that we were not able to spend more time there. Would definitely recommend it to others... Fantasitc holiday, saw alot in a short time... We would have no hesitation recommending Think Sicily to others. It was extremely professional: staff were friendly and extremely responsive to all out enquiries. We hope to use you again in the future. The villa truly was stunning and we had an amazing time... The views from the villa were absolutely incredible, and Cefalu was such a friendly, beautiful little city. The villa was terrific and I have nothng to compain about! It was very well stocked house and pool and grounds were amazing - the location was superb. Property was lovely... the view was the selling point for us all - it was fabulous... The owner was delightful - had a lovely chat Italian/French/English+Hand signals! Magnifient setting very well-equipped, modern, light and airy perfect for a family holiday. Owner/local rep very obliging and helpful. Very happy with Casa Nuvola. Excellent! We liked everything in Sicily. The villa Casa Nuvola was really wonderful. The owner was very friendly and helpful. We were glad to meet him. So I think, that villa is a perfect place to relax with all family! we all love it.... (Our holiday) was fabulous. Awesome villa, it was even better than the pictures. Very well equipped, and spotless. The owners were lovely... liked little extras such as there being a bbq and lots of cleaning fluids already supplied, luxury towels too which was appreciated... It (our holiday) was perfect. The villa was wonderful, the setting perfect, everything even better than imagined... The in-villa cook (and team) was amazing... They created a delicious wedding breakfast for seven for us, and tidied, and were smiley. It would have been wonderful to have had them catering for us all week. Truly gave us a taste of the freshest most delicious Sicilian food, a definite highlight of the holiday. 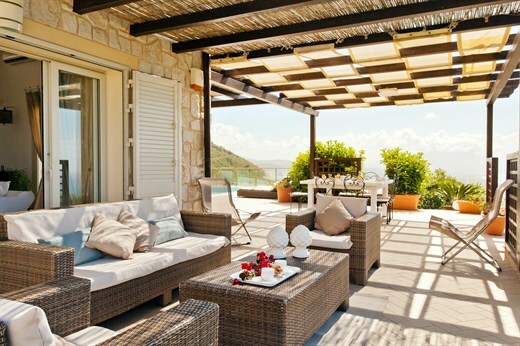 We have rented many villas in Corsica, Sardinia and France, none of them were close to Casa Nuvola. Excellent! The photos (on the website) were very accurate. Casa Nuvola was everything it promised from the photos... We had a brilliantly relaxing time... The culture, food, weather and architecture in Sicily was fantastic. Quite pricey (it is more than we usually pay for a villa for a week) but it was a lovely villa. Sehr schöne Villa und ganz großartiger Ausblick.Der Kochservice ist ganz großartig.